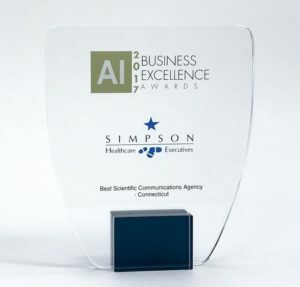 Simpson Healthcare Executives have announced that they have won “Best Scientific Communications Agency-CT” at the 2017 Business Excellence Awards, presented by Acquisition International Magazine. Simpson Healthcare is a diverse, scientific strategy and communications agency, founded in 1998 by Kelly Simpson-Angelini, CEO+CSO and located in Old Lyme, that challenges all healthcare stakeholders to think disruptively about change in healthcare. Acquisition International featured Simpson Healthcare in a congratulatory interview in their Winners Supplement for the 2017 Business Excellence Awards. Simpson Healthcare is honored to have won this prestigious business award at the 2017 Business Excellence Awards, a program that was created to acknowledge the trailblazers of the corporate domain. Their agency is proud to have been designated as one of these leading, esteemed organizations who have demonstrated creativity, commitment, experience, and strong leadership in the modern corporate business climate. Simpson Healthcare would like to thank their internal teams and their leadership, as they are proud to have the right people on every team; they have created a great, talented culture of learning, science, and innovation that is rooted in the agency’s purpose: to support our clients in sharing the scientific story of the diseases they touch and therapies they discover for all in need. The Simpson Healthcare team looks forward to the future as they unite to advance science and the discovery and development of the game-changing therapies for their clients, and encourage collaboration among key stakeholders to improve the healthcare experience for patients into the next coming decades. Acquisition International is a monthly magazine published by AI Global Media Ltd, a publishing house that has reinvigorated corporate finance news and reporting. The magazine has a global circulation, which brings together all parties involved in deal-making and, in an increasingly global deal market, is uniquely positioned to reach the deal-makers that matter. For more information, visit: http://www.acquisition-intl.com/. Simpson Healthcare Executives is located in Old Lyme, CT and is a global leader in biopharmaceutical marketing and communications, dedicated to driving therapeutic innovations forward. Since 1998, Simpson Healthcare Executives supports their clients in sharing the scientific stories of the diseases they touch and therapies they discover for all in need. For more information on Simpson Healthcare Executives, visit: www.simpsonhealthcare.com.